Surfmud was created by "a couple of guys from the Sunshine Coast" who couldn't find a zinc cream with the staying power to last for long surf sessions in tropical conditions, so they decided to develop one themselves. After six years of effort, during which they tried over one hundred different formulas and spent thousands of hours in the surf testing them out, they finally hit upon the right mix of ingredients that provides the ultra-long-lasting protection they need. Made by hand on the Sunshine Coast in Queensland, Australia, Surfmud is especially designed for those who lead active, aquatic lifestyles, and protects the skin from environmental damage by providing a mineral-based, physical barrier that stays put. 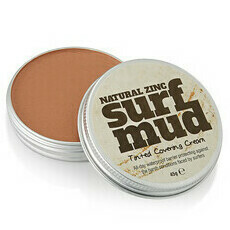 Surfmud comprises 30% Zinc blended with natural ingredients, is only tested on surfers – not animals, is reef-safe, and comes in recyclable packaging.